Changing your old wooden spindles for a more modern look comes with a number of cost-effective advantages that will make your home feel more spacious. If you have ever found yourself walking back in from a long day at the office and feel as though that warm, welcome back home feeling is missing, there is a simple solution – reinvent your staircase. It could be time to do away with the old wooden spindles on your staircase and show off with new Reflections Glass Balustrade to give your home a new modern feel this New Year. It could be exactly what your home needs to feel even more like a home. Should you decide to change over to Reflections Glass Balustrade; you may notice your home does not appear as dark as it once did in the winter gloom. That is because unlike wood, glass does not block the light and will allow your home to become fully illuminated with natural light. No longer will you be forced to turn the lights on even though it is still bright outside as you will be able to enjoy the natural light throughout your home. Another advantage of switching to Reflections Glass Balustrade is that glass is much more durable than wood, despite many peoples’ misconceptions of glass being a fragile material. Over the course of just a few years, wood can suffer from corrosion or suffer from infestation. In contrast, glass will maintain its durability and quality over time and ages much slower than wood. 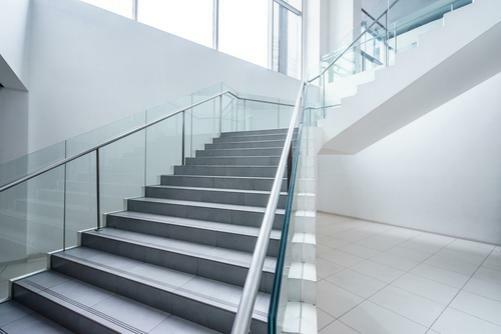 Not only will a simple wipe do the trick to bring your new staircase parts back to life, but it can save you costs of replacements and repairs in the future. You will also feel as though you have undergone an early Spring Clean with the illusion of added space in your home. Immediately you will notice the different and instantly feel less cluttered, allowing you to enjoy your home to the fullest and give you that added confidence to invite guests round. If you are interested in finding out more about how a facelift to your staircase can transform your home then get in contact with the Blueprint Joinery team today and we will take you through our options. We supply all of the parts needs to install at home and offer any guidance to ensure the job is a good one.